The elusive concept of “the Catholic Vote” frequently makes an appearance during elections and this year’s Australian Federal election will be no different, writes Archbishop Mark Coleridge on the ACBC’s own Media Blog. But like all groups, Catholics are a broad and diverse lot, representing a wide cross section of the Australian population. One in four Australians are Catholic. A quarter of the 5.4 million Catholics in Australia were born overseas and more than two thirds of this group are from non-English speaking backgrounds. The top five non-English languages spoken are Italian, Filipino languages, Spanish, Arabic and Vietnamese. That diversity is a great strength as it allows us to have a great many perspectives on how best to apply Catholic social teaching to the problems that face Australia. The first point of contact with the political process for most of us is the local candidates that present for election. The bishops have asked us all to meet with local candidates and make our concerns known. That’s important because however presidential the style of campaigning that we see every night on the television, ultimately we vote for local candidates – not national leaders. If we can award the best of the local candidates with our vote, that’s one of the most important steps we can take to ensure the national parliament runs well. As Christians participating in the democratic process, there is often an understanding that some issues trump all others, or that Catholic or Christian candidates are better than other candidates. While some issues carry particular weight, the common good should always be at the heart of our vote. As pointed out in the statement, ‘the good of the individual and the good of society as a whole must be brought together in harmony. When they are, we have the common good.’ When they fight against each other, we end up with neither the true good of the individual nor the true good of society as a whole. We are individuals, but we are also a community. If we don’t get that balance right, we get both elements wrong. This is not a time for religion to be pushed into some private corner, even though there are strong pressures of that kind at work in our society. Practicing our faith is about more than prayer and going to church, important though they are. It is also about living our faith in the wider world and in service to others. Catholics have participated in the political processes of countries under dictatorships and democracies; under Prime Ministers and presidents. They have voted for conservative parties and progressive parties. Curiously, at the current moment, there are Catholic politicians who are members of every single Australian political party. Sometimes, their Christian faith is at the forefront of their decisions, and other times it seems not. In Australia over the coming months, we have the privilege of being able to consider our vote carefully, with a relatively free press and a range of politicians from a variety of persuasions. We do not live in a dictatorship, but rather a parliamentary democracy. No one will be arrested for voting or risk death as they head to the ballot box. While Catholics voting habits may trend in certain ways by virtue of ‘hot button’ issues, the Catholic Bishops of Australia have released a statement which argues strongly that we should inform our consciences in a broad sense. ‘The principles of social teaching cross party political boundaries and Catholics may, in good conscience, form different opinions on the candidates and parties standing for election’ – reads the introductory letter to the statement. During the 2004 Federal election, Anglican charity, The Brotherhood of St Laurence, used the clever slogan ‘This election, vote for someone else’. This was not them necessarily saying that people should not vote for the incumbent (though that may have been a tongue-in-cheek way of saying it), but rather exhorted all people of good will to not only consider their own ‘hip-pocket nerve’ but to look deeper at issues that affect others. 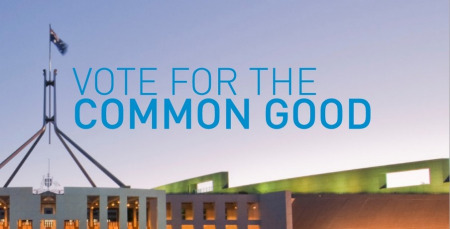 The Catholic Church’s 2013 election statement takes a similar position in ‘A Vote for the Common Good’. While tensions will run high over certain issues, looking holistically at each party and learning about their policies is the best way to participate in the political process. Pray about who you vote for, and pray for the candidates who stand for election, and most importantly think beyond your own individual needs as you go to cast your vote – vote for the common good.